I LOVED the freshness and comfort of this meal! 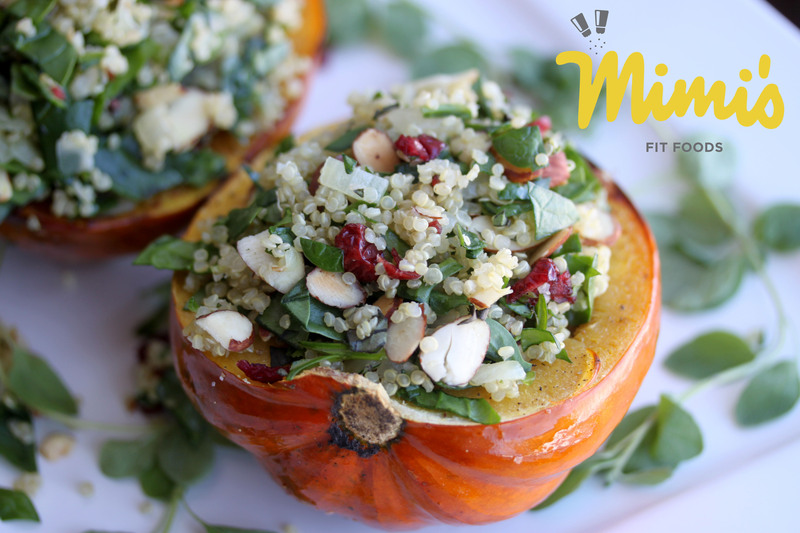 I love roasted squash and filling it with a delicious quinoa salad is just plain fabulous! The roasted squash offered the “comfort” and the quinoa salad offered the “freshness.” And, even better . . . they go SO WELL together! 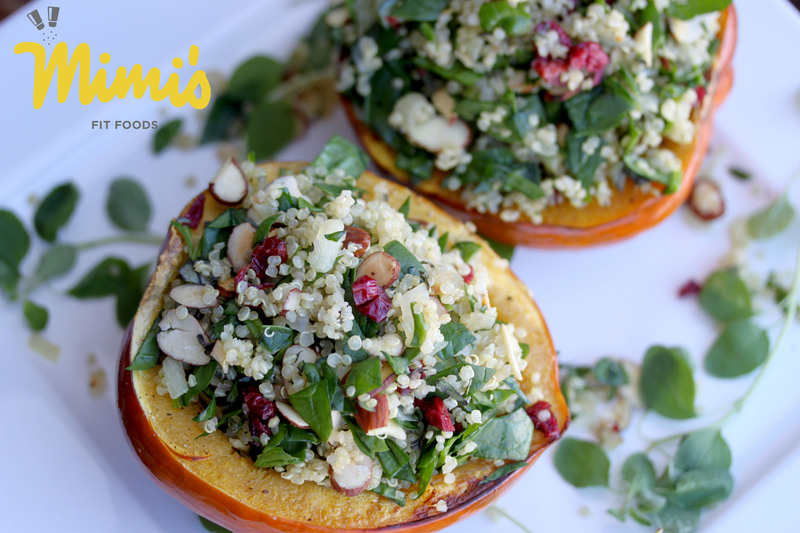 The textures are amazing with the softness of the squash and quinoa being combined with the crunch of the almonds and spinach and then topped off with the chewiness of the dried cranberries. And, probably without even having to say it, the flavors all meld well together. This is a beautiful meatless meal. I had a couple of acorn squash that were begging to get used so this is what came of them. We had it for lunch and loved it. Pre-heat oven to 350 degrees F. Meanwhile, cut acorn squash in half, vertically, and remove the seeds. Drizzle olive oil over the flesh of both pieces of squash, then sprinkle with salt and fresh ground pepper. Place squash, flesh side down on a foil lined sheet, and bake for 30 minutes. While squash is baking, combine quinoa and water in a medium pan. Bring to a boil, then lower heat, and cook until water is absorbed, and quinoa is nice and fluffy. While quinoa is cooking, heat olive oil in pan, then add onions and cook until translucent. Push onions to the side of the pan, and add almonds, stirring constantly for a couple of minutes to toast. Remove pan from heat, and set aside. When quinoa is done cooking, pour it in to a medium bowl, then stir in onion/almond mixture, cranberries, spinach, and oregano. Season with salt and pepper to taste. When squash is cooked, remove from oven and place each piece on a plate. Scoop 1 cup of quinoa pilaf mixture in to each squash half and serve. Hi! So glad you liked the recipe, and your adaptation looks delicious! Thanks so much for your sweet comment on my blog 🙂 Hope you have a fabulous week!